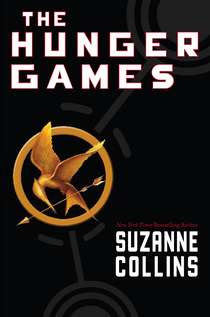 The Hunger Games was written by Suzanne Collins. It is book 1 of a trilogy... and is set to be a movie soon. Could you survive on your own, in the wild, with everyone fighting against you? Twenty-four are forced to enter. Only the winner survives. In the ruins of a place once known as North America lies the nation of Panem, a shining Capitol surrounded by twelve outlying districts. Each year, the districts are forced by the Capitol to send one boy and one girl between the ages of twelve and eighteen to participate in the Hunger Games, a brutal and terrifying ﬁght to the death - televised for all of Panem to see. I have to start out by saying that The Hunger Games was one of those book series that EVERYONE I follow online was talking about (I know that "everyone" might a slight exaggeration). It seemed to be THE book trilogy to read. I don't know why I do this... but when a book series gets so much hype I avoid reading. I don't know if I'm afraid I'm not going to like it as much as everyone else and will be let down... or if I'm afraid I'm going to like it too much and get drawn into an obsession. (um... Harry Potter... Twilight...) I really don't know why. I finally gave in and looked the books up. I have admitted before that I (embarrassingly) am a person who first judges a book by it's cover. The Hunger Games cover... didn't impress me. I immediately thought "why is everyone so hot on this book???" I put off reading it again. Finally... I gave in. I downloaded all 3 books at once and figured "fine... I'll just read them and get it over with." Well, I definitely can say I read them and got them over with. I couldn't put them down. Oh, my, obsession. I read all 3 books in a week in Florida this summer. I would put a book down... go put the girls to bed... and then come running back to the book almost out of breath from sprinting across the house. I was seriously that absorbed in the stories. After finishing all 3 books I will admit I just about forced other people to read them. Forced. Seriously... if you haven't read them.... go... now... read.